The best way to prepare for both the AQL and MAT tests. This NBT preparation Online course is the only NBT course which prepares students for both the AQL test and the MAT test. Consisting of videos where experienced, engaging teachers walk students through NBT example questions and best practices. This course fully prepares students for what to expect in the NBTs. 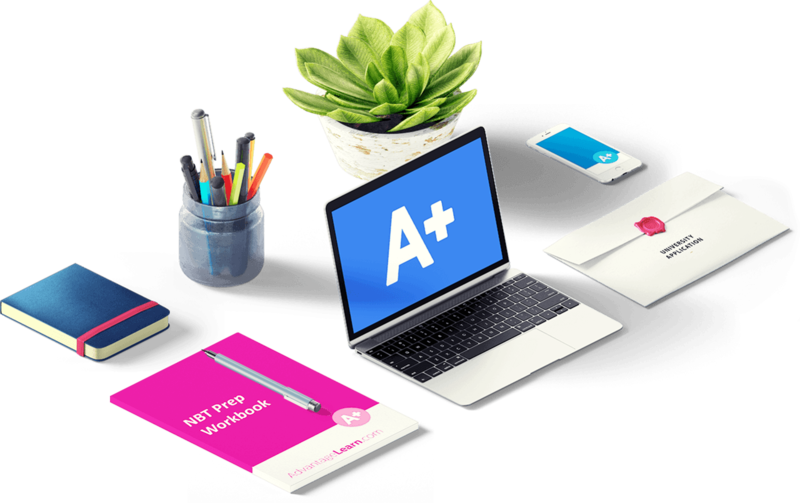 Alongside the teaching videos are notes to download, practice NBT quizzes to see how you're performing in each section as well as live-chat to ask NBT mathematics questions directly to our teachers. Learning online enables students to work at their own pace. Pause and rewatch videos to make sure you have time to process what you are learning. Repeat our quizzes as many times as you like to ensure that you are able to work at the correct pace and with the right level of accuracy during one of the most stressful exams of your Matric year! This NBT preparation Online course is the only NBT course which prepares students for both the AQL test and the MAT test. Consisting of videos where experienced, engaging teachers walk students through NBT example questions and best practices. This course fully prepares students for what to expect in the NBTs. Alongside the teaching videos are notes to download, practice NBT quizzes to see how you’re performing in each section as well as live-chat to ask NBT mathematics questions directly to our teachers. Learning online enables students to work at their own pace. Pause and rewatch videos to make sure you have time to process what you are learning. Repeat our quizzes as many times as you like to ensure that you are able to work at the correct pace and with the right level of accuracy during one of the most stressful exams of your Matric year! AdvantageLearn has been offering NBT preparation to students across South Africa since 2013. Feedback from students has been that this course, if done in the right way, is an NBT game changer and that they have walked into their NBT feeling more confident. Let Advantage Learn help you achieve the results you need. Quantitive literacy (QL). This section teaches you how to interpret common numerical questions you will come across daily, such as percentage changes, distance measurement and reading information from different graphical representations. Mock NBT test. Test your knowledge on a full NBT. We have created a full mock NBT test so that you can see what it is like to complete the test. Our test is designed to be as hard, if not harder than the NBT. If you can complete this then you can be confident of your NBT test! NBT past papers are not available. The National Benchmark Tests Project have chosen not to release them to the public. Fortunately, with our experience and knowledge of the NBTs we have produced Advantage Learn Mock NBT tests for you which are very well aligned. We have chosen to make them difficult which means that if you do well in studying and practicing with them, then you can be confident in sitting your NBTs afterwards. So far the course is very helpful. I would recommend it to anyone preparing to write their NBTs. I improved my NBT score by more than 25% after doing this course! Highly recommend! All my friends who took the NBTs failed. Not me. The difference? I had Advantage Learn on my side! Seriously the NBTs were tough and I'm really glad I got help. Honestly when I wrote the NBTs it practically felt like I was cheating, because I recognized concepts in the paper literally designed to throw me off, then quickly and efficiently answered their related questions. Thank you so much Advantage Learn! I'd recommend this to anyone writing the NBTs, especially those who finished school with the Cambridge curriculum. Trish, who I'm pretty sure is the mathematics teacher, is really the bomb. She is querky (in the good way) and genuine. Although I cannot remember the English teacher's name, she offered no less in terms of expertise. I got this vibe from her that she'd be one of those 'strict' teachers, but I'm sure she is rather nice *insert laughing face*. Lastly, the actual course as a whole was fantastic. I just wish I had prepared more. Courses and lessons very well done and put together. Super helpful!! I used so many of the tips in my NBT! This course was definitely worth it! I gained so much information from this course that realy helped me with my NBT's and would recomend it for anyone else. It was a great course, and adequately equipped me for my NBTs. I would definitely recommend it to future scholars planning on writing NBTs, especially if the NBTs play a large role in your acceptance to South African Universities. The exercises are extremely helpful. It's a great course. Very thorough. The only thing that's missing is from the maths section: logarithms and other matric work taught later in the year. The support team is also really helpful. I love the questions. They're really great and easy to understand. Thanks for making this program available to me. The reason why I gave only 4 stars was because the questions were not enough. Please try to increase the questions. Thanks. Thank you so much Trish! It has been so helpful and a pleasure to use! This course is not only helping me with studying for the NBTs, but teaching me a whole lot of new vocabulary and interesting facts.